A Growing Backlash Against 'Amish Exploitation' In Pennsylvania Locals in Lancaster County, Pa. — where the Amish community plays a big part in agriculture and tourism — are speaking out against reality TV shows like Breaking Amish and Amish Mafia. 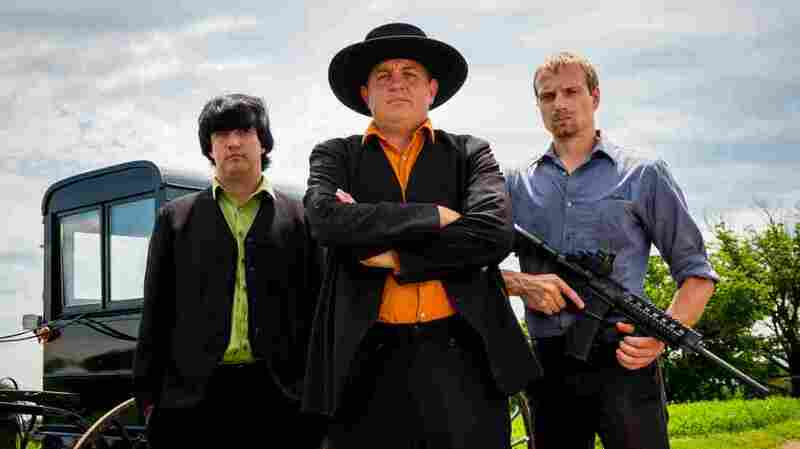 Lebanon Levi (center) is depicted as the ringleader in Discovery's Amish Mafia. Locals in Lancaster County, Pa., say the reality TV show and its spinoffs are offensive fabrications. It's no secret many "reality" TV shows bear little resemblance to actual reality. Discovery Channel's hit show Amish Mafia is a vivid example. The show portrays Amish youth in rebellion, racing buggies and carrying guns. Amish characters appear on screen and describe for the camera how the "mafia" operates outside of Amish law. In reality, the Amish don't like to be photographed, and rarely speak out publicly. Now, locals in Lancaster County, Pa., where the show is filmed, are fighting back against what they call "Amish exploitation." Amish scholar Donald Kraybill, a professor at Elizabethtown College, says many of the people on the shows were raised in the community but never officially joined the religion. And, he says, the violent images are completely at odds with the group's pacifist beliefs. "There's no Amish mafia. There never was," Kraybill says. "The whole thing is a fabrication in the minds of the producers." Breaking Amish on TLC follows a group of young Amish and Mennonites who move to New York City. Amish Mafia is set and filmed in Lancaster County, in the heart of Pennsylvania Dutch country, where the Amish community plays a big part in agriculture and tourism — two of the region's biggest industries. With the show's success, others followed, including Breaking Amish and Return to Amish. Earlier this summer, when Lancaster filmmaker Mary Haverstick heard there would be another new show, called Amish Haunting, she got fed up and started a Facebook page called "Respect Amish" to oppose the shows. "And I kind of put out there the opinion that I think so many Lancastrians are thinking," she says, "which is, 'What in the world are these shows doing?' "
Discovery Communications declined to comment for this story. The New York City-based production company Hot Snakes Media, which created the shows, did not respond to repeated requests to comment. The "Respect Amish" Facebook page rapidly grew into a movement. Groups ranging from the Lancaster Chamber of Commerce to the local Council of Churches voiced support, and Haverstick started to hear from members of the Amish community. "The Amish elder who told me that these shows make them look like garbage — when he said that to me with clear pain in his voice, I think it's a moment I'll never forget, and I knew right then we were on the right track," she says. Within a few weeks, every single politician representing Lancaster at the local, state and national level voiced support for the Respect Amish movement — including Pennsylvania's two U.S. senators and governor. Dan Stoltzfus is an Amish man who has a baked goods stand at Lancaster city's farmers market. He's never watched the shows, since the Amish typically shun modern conveniences like electricity, but he's aware of them and finds the portrayals offensive. "It's all fake. It's not the real thing," he says. Yet some people are still confused. The Lancaster City Police Department had to come up with a standard form explaining the shows are fake, in response to repeated questions from viewers about why they haven't done more to combat the "mafia." 'Amish Mafia' is a deliberate misrepresentation of their religion. And to me, that is a line in the sand. Kraybill, the Amish scholar, says he doesn't object to negative portrayals of the religion; after all, the Amish are humans who sometimes commit crimes. "But in this particular case, Amish Mafia is a deliberate misrepresentation of their religion," Kraybill says. "And to me, that is a line in the sand that Amish Mafia has crossed and never apologized for. There's no shame involved in it for them." He thinks the Amish are an easy target, because they believe in turning the other cheek. Meanwhile, Haverstick, the filmmaker who created the initial Facebook group, wants to shut down the productions. She's asked for a meeting with the Discovery Channel, and says her group's next move will be to put pressure on the show's sponsors.